Today’s post is about the Guruvilu or Gurufilu (as I choose to write the name, the fox-snake, from the meaning of the Mapuche words that make up its name: “guru” = fox and “filu” = snake. This is a distinctive creature, found in Northern Patagonia and also in Chile south of Valparaiso. I have not found any references regarding the Tehuelche people, but maybe the "water tiger" and the "iemisch" myths may be their way of describing the same creature. The first written accounts on the fox-snake until 1880. Evidently Vidaurre had different sources who were talking about different animals. One of them seems to be the “Cuero” (cow hide) while the other is the Guruvilu (the slender fox headed being). The creature was also reported by Luis de la Cruz during his 1806 trip across northern Patagonia from Antuco to Buenos Aires in Argentina. He wrote that his native guides had seen, in a lake, in northern Patagonia, “animals like cats that kill horses that are called nirribilos”. The creature was also reported by Federico Barberá, a military commander in the Argentine war against the Puelche natives in the Pampas and close to the northern border of Patagonia. In the 1860s and 1870s, he had close contact with these “Araucanized” Tehuelche people, the Puelche. They had adopted the Mapuche language and maybe some of their myths. He wrote that their word Yhuayfilú described a “Dragon (or fabulous monster)”. The filu part of the word is the Mapuche word for snake. I have not been able to find what Yhuay means. Julio Vicuña Cifuentes wrote about the Guruvilu in two different books. He writes the name Guirivilo or Nirivilo (though at one time he preferred Guirivilu or Nirivilu). He says it is the combination of the Mapuche words gúrú (mid sized vixen) and vilu (non venomous snake). Mackenna, like Vidaurre blends Cuero and fox-snake into one creature. But they are two distinct animals. Black snake or fox snake? Note that is Mapuche for black, thus curuvilu, as spelled by Mackenna, would be a black snake. This also neatly fits his description : “horrible black snake”. It could also be a spelling mistake (a “C” instead of a “G” which transformed “Guru” into “Curu”). In either case, the curuvilu despite having a different name, must be a fox-snake. 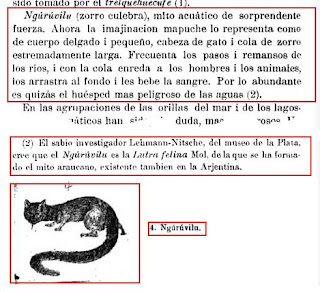 Guevara includes an image and a footnote in which he states that Lehmann-Nitsche of the La Plata Museum (Argentina) believes that this creature is actually an otter Lutra felina and that this originated the Araucanian myth, also found in Argentina. Below we will look into Lehmann-Nitsche’s theory. was taken by the tail of an animal, that squeezed him and pricked him. He took out a knife and cut off the animal’s tail. The tail was like two ‘varas’ [*] long: he took it: it was like a saw, it had like claws, what it took, it did not let go; it had the claws facing forward. That is why nobody escaped. Since then no other canoe was overturned. [*] “Vara” is an old Spanish unit of length equivalent to roughly 84 cm (33 in.). This tail was about 168 cm long [66 in]. The following map shows the places mentioned in the text and the region (colored yellow) where the Guruvilu has been sighted. 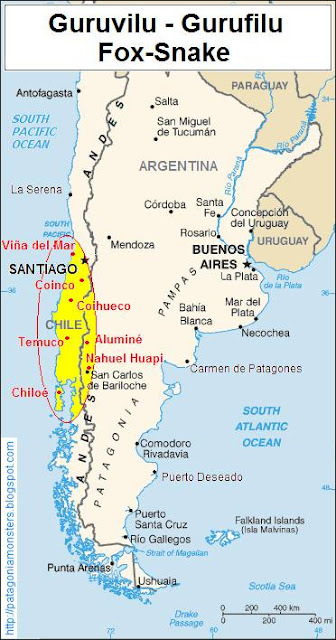 Notice that its habitat and the territory of the Mapuche people coincide. Map showing area where Guruvilu is said to live. 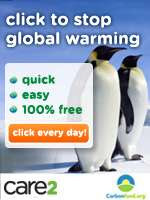 © Copyright 2010 by Austin Whittall. In 1901, during the period when several expeditions were sent to hunt down the Patagonian mylodon (see my post on the Mylodon Saga), Robert Lehmann-Nitsche wrote an article in which he suggested that the mysterious surviving mylodon was in fact an otter. He mentions a meeting in which he, a colleague and English explorer Hesketh Prichard (sent to hung the mylodon) met Florentino Ameghino (1854-1911), an eminent anthropologist, zoologist and paleontologist. told us about correspondence of his brohter Carlos according to which the Patagonian Indians had seen the tracks of an animal with natatory membranes, besides, they called a misterious aquatic animal erefilú. The fox-snake lives in the water. It garbs people in the water. It has a tail withi which it grabs people. But if venerated, he does nothing. There is a lake in the cordillera. There are many fox-snakes in this lake […] He saw the fox-snake […] it was swimming in the water when we saw it. It is small, its chest and belly, white; the tail is long. The lake was the Aluminé (39°14’ S, 70°55’ W) and the incident happened when Nahuelpi was eight years old (ca. 1880s). Perhaps Siemiradski had the right name and description and that it was really another creature, a “terror bird” myth. It may be coincidence that nervelu and Guru vilu sound alike. Read my post on Big Terror Birds in Patagonia . piguchén [*] monster, half fox and half serpent that usually lives in marshy waters, has vast strength and is very harmful. On the south of the Island it is a dog with a fox tail. [*] In this text, picuchén is used as deformed, ill shaped, supernatural. 1. Could it be an otter? This was the animal that the Mapuche feared most and was the most difficult to hunt. Carbjal believed, that it was an otter, but the natives told him that otter were well known and common while Guarifiú was “rare and terrible”. He managed to have one hunted, and he described the specimen as larger than the Chilean otter but otherwise normal. He concluded that the Indians always exaggerated. Perhaps, not knowing about the Huillín neither of them ascribe the myth to it and chose the Chungungo instead. Though Carbajal comments have led scientists to believe that the fox-snake is an otter, I am not convinced because, it may be possible that the natives did not send him a Guarifiú, but an otter (easier and safer to hunt); furthermore the Mapuche knew all about otters, which they called Huillín so if they defined an animal with a distinct name (gurufilu, it must have been some other kind of creature. Going back to Lehmann-Nitsche at Aluminé he believed that the fox-snake myth combined features of both huillín and jaguar  but Latcham disagreed; for him the otter did not have any part in the fox-snake myth for it had been incorporated into the Mapuches’ “ñul-ñul” and “Llun-Llun” myths. In any case, there is a real animal in Chile that goes by the name nguruvilu. and according to Latcham it belongs to the family of the tiny “monito del monte”; how could have a minute and shy marsupial lend its name to the fearsome killer water fox is an unsolved mystery. 3. water tiger and snake fox. Similar creatures. The “fox-snake” resembles the “water tiger” (see my post on this being) in many ways; both are aquatic carnivores that drag down and kill large animals and men. Perhaps their different names reflect local variations of the same species. We should not be surprised to find two other animals that are virtually identical to the fox-snake living along Patagonia’s northern border, Maripill and the Colorado River animal. Vicuña Cifuentes, J., (1915). Mitos y Supersticiones Recogidos de la tradición oral chilena con referencias comparativas a los de otros paises latinos Impr. 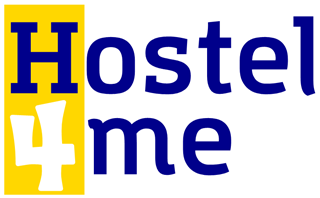 Universitaria. pp. 65-66. Vicuña Cifuentes, J., (1910). Mitos y Supersticiones Recogidos de la Tradición oral Impr. Universitaria. pp. 23-24. Latcham, R., (1924). Op. Cit. pp. 573-575. Guevara, T., Op.Cit. pp. 412. Siemiradski, Josef. Beiträge zur Ethnographie der südamerikanischen Indianer “Mittheilungen der Anthropologischen Gesellschaft in Wien”, XXVIII Bd., 1898, pp. 127-170, esp. p. 166. Molina, J. Op. Cit. pp. 233. De la Cruz, L. Op. Cit. pp. 110. Latcham, R. Op. Cit. pp. 609. Koessler-Ilg, B., (2000). Op. Cit. pp. 73. There was a creature beached on the shore, so nobody could play at the beach today. The creature looked like a thin crocodile with no legs, with spines on its back. The head looked like a cute fox with large pointy ears. They called it a "Patagonia" in my dream. Long story short, it made it back into the water and everything was good. But as soon as I woke up, I grabbed my phone and googled "fox head snake patagonia" and came across your site. Prior to this I had never heard or thought of such a creature! How eery!